2. Massaging the natural ear. 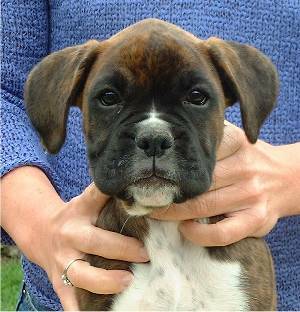 This procedure can be done on either puppy or adult ears. 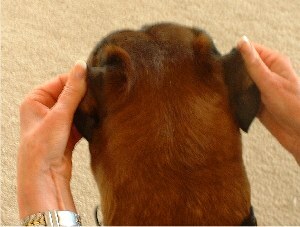 Most owners of "show prospects" use this massage technique as a precautionary measure to encourage the natural ear to remain in the correct position. I also encourage "pet" owners to try it, as the correct fold is very attrative. This can be done as a form of petting when the dog is relaxed. 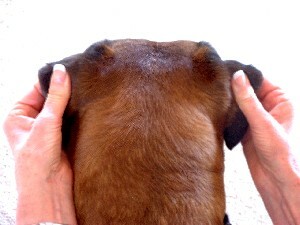 A dog with the correct weight and texture of ear will usually have correct ears as an adult, but if a dog has a smaller ear with strong cartiledge I have found that the ears will persist in "flying" and no amount of taping or massage will correct this permanently, but can be done as a temporary measure. 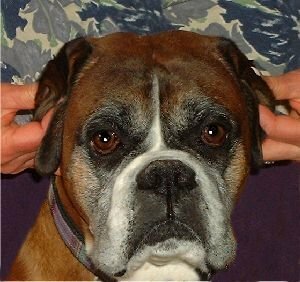 Luckily this small ear is not seen as much today, but if you are worried about a pup's ears the massage technique is very useful one to know. 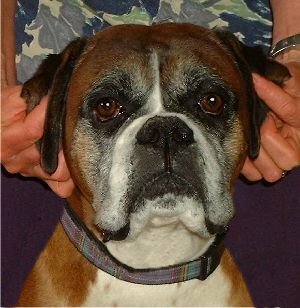 Have the dog sit next to you or on the floor in front of your chair. forefingers into the front crease. as if you were rolling a ball of dough between your fingers. a definite crease at the top and in the middle of the ear. Keep massaging for a few minutes. The longer the better! AND YOUR DOG WILL LOVE IT!! !